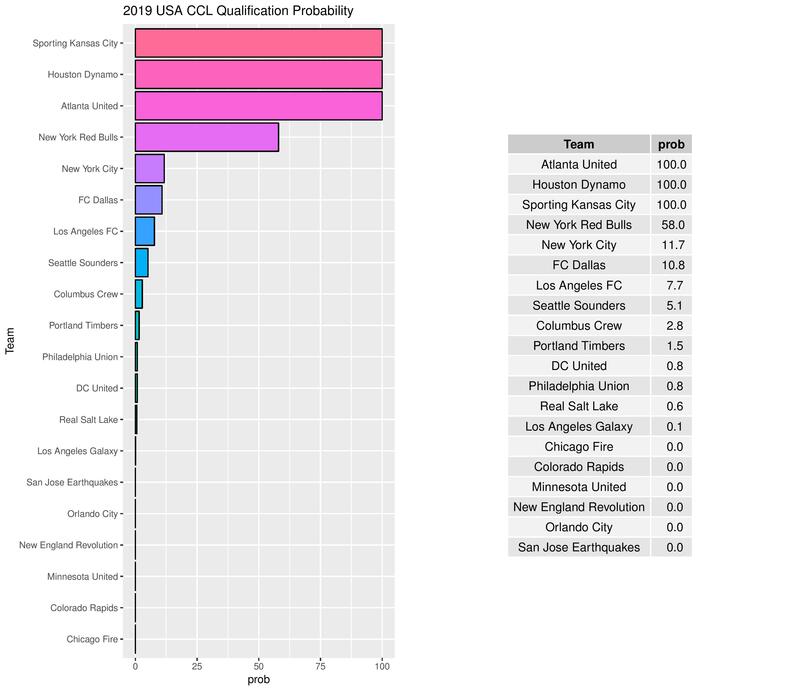 Below are the 2018 MLS season forecasts using data from games through September 30. 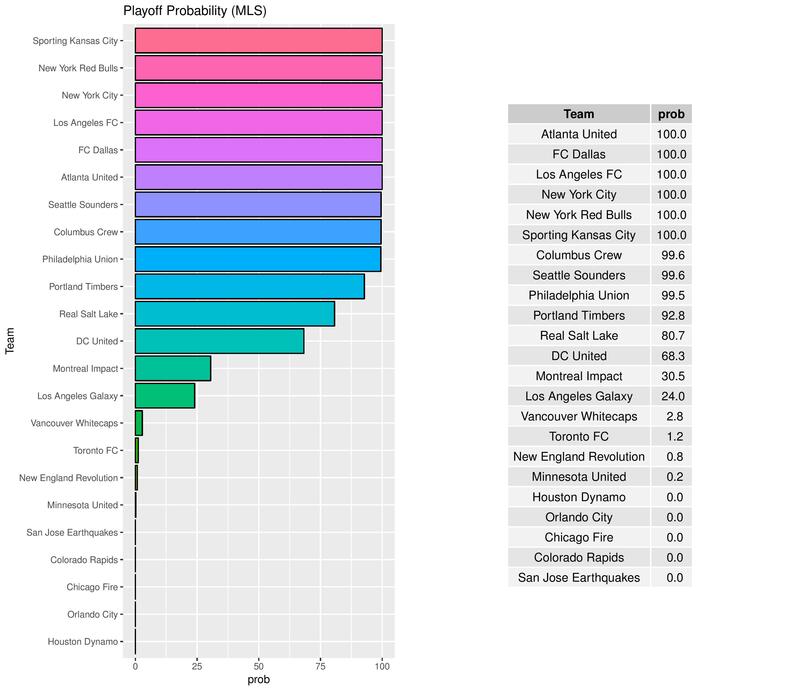 Union playoff chances: The Union now have a 99.5% chance of making the MLS playoffs, up from 98.8%. 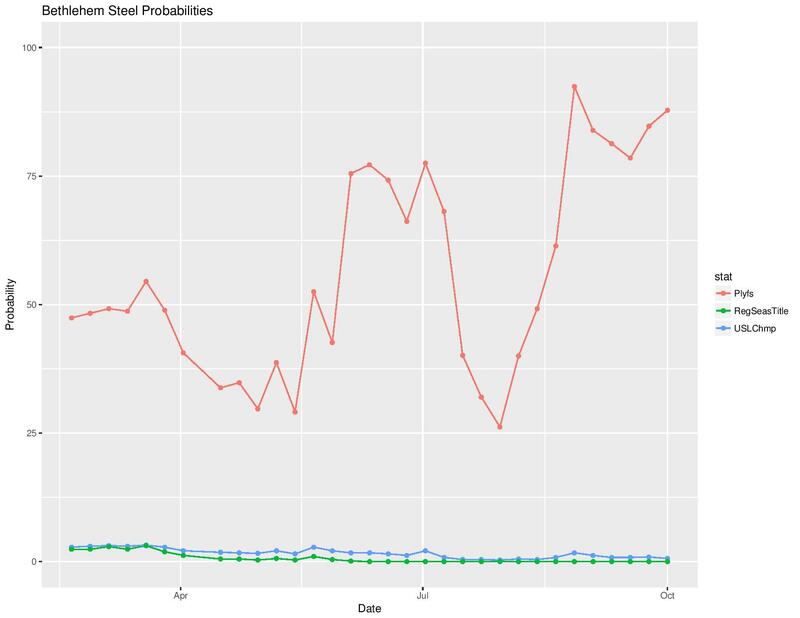 Bethlehem playoff chances: The Steel have an 87.8% chance to make the USL playoffs, up from 84.7%. 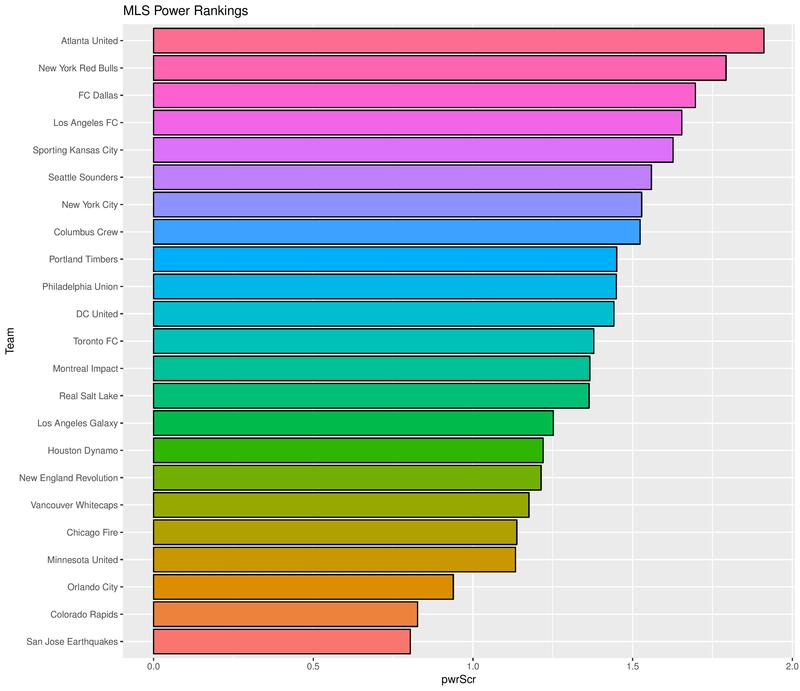 Largest movers: D.C. United gained the biggest boost in performance expectations for MLS in the past week, and Vancouver had the largest drop. Plus/minus: The two top players in the league, in terms of their teams’ goal differentials when they’re on the field, are Atlanta United’s Michael Parkhurst and Brad Guzan. The top Philadelphia players for this stat are Cory Burke and Jay Simpson. 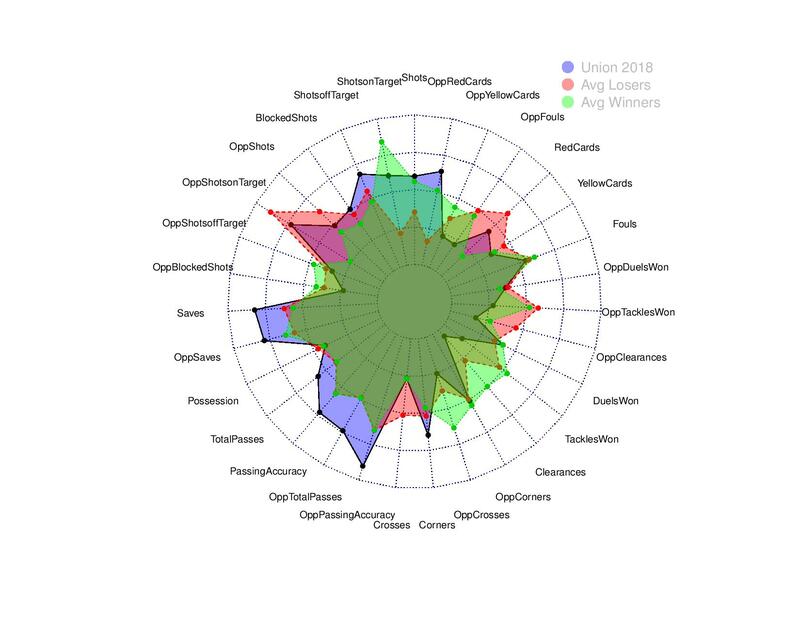 This following chart shows the Union’s 2018 stats, as compared with typical winning and losing teams. 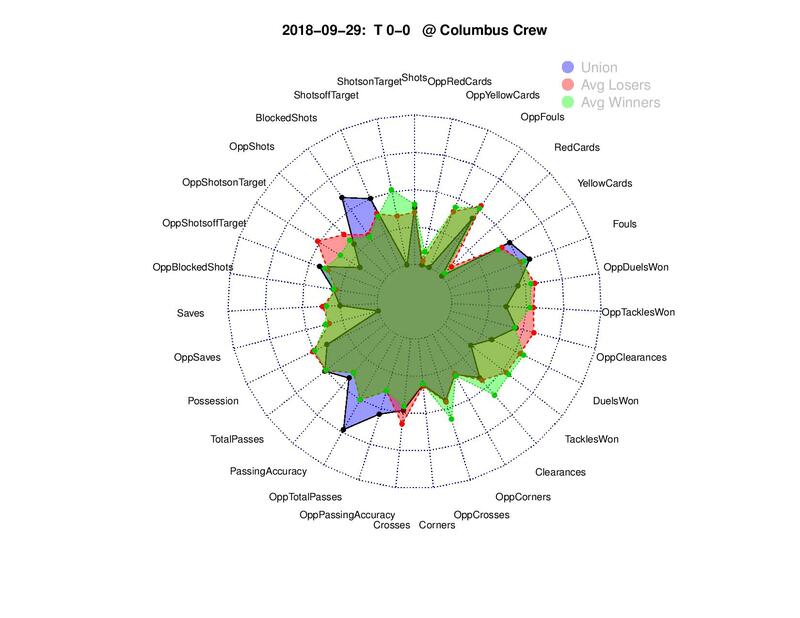 This following chart shows the Union’s stats in recent MLS matches, as compared with typical winning and losing teams. 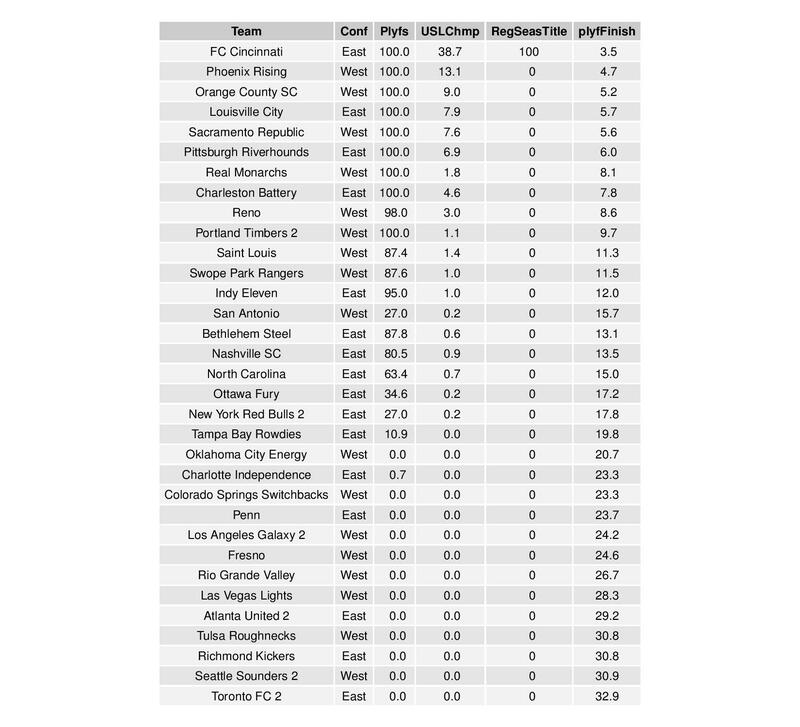 The scores used for these rankings are the expected points-per-game for all league opponents both home and away. 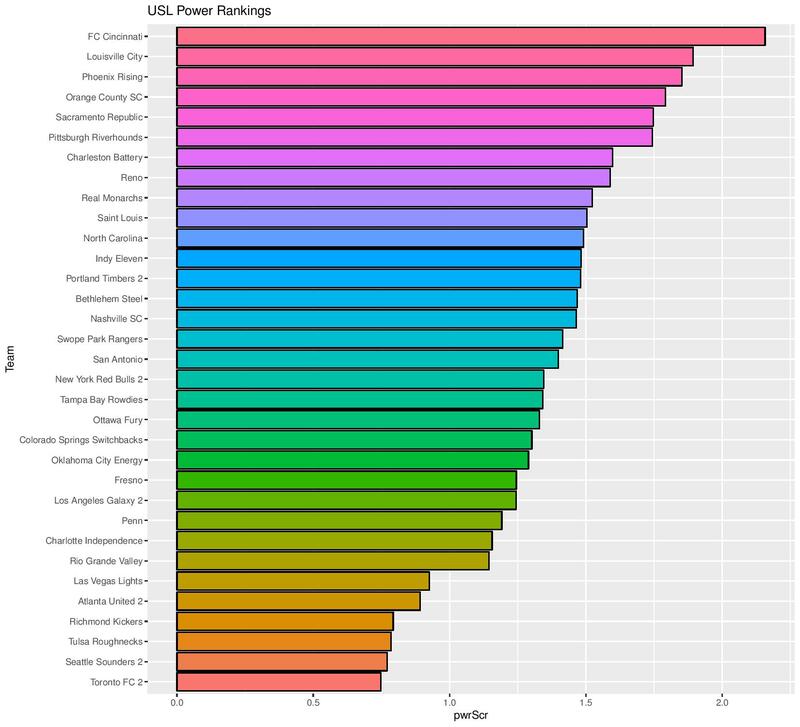 SEBA has Philadelphia declining from 9th to 10th. 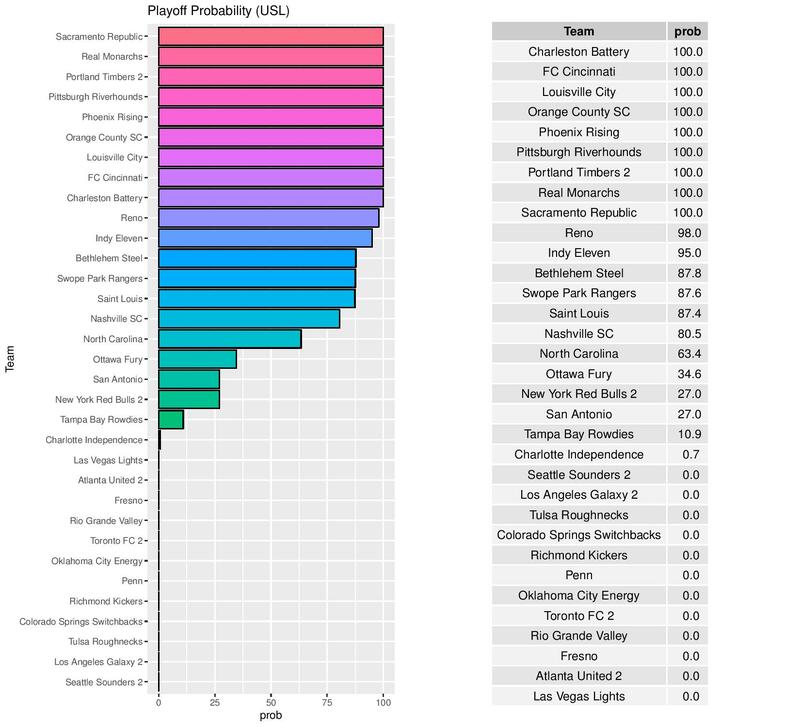 Philadelphia has increased from a 98.8% to a 99.5% chance of making the playoffs. 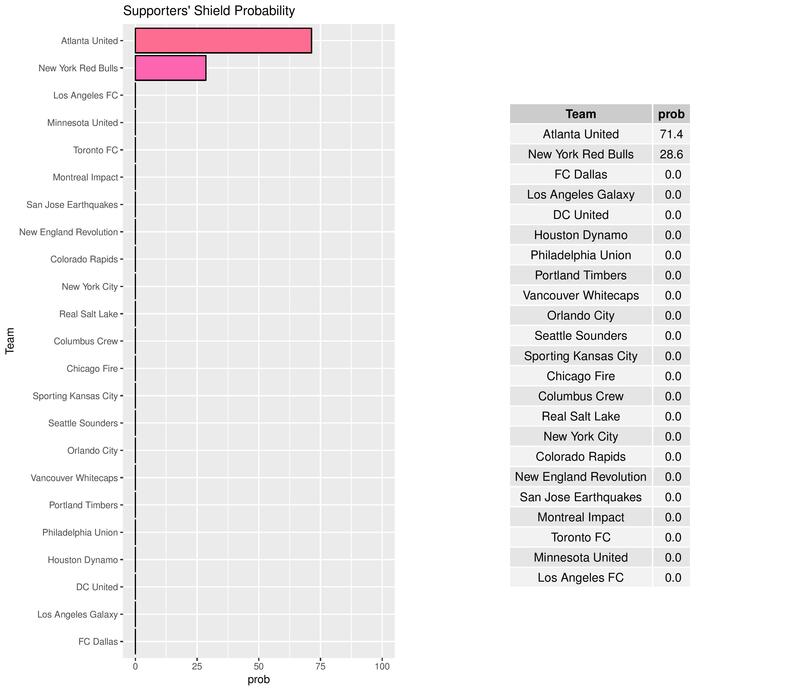 Next is the distribution of Philadelphia’s points against the MLS East’s sixth seed in all the simulations. 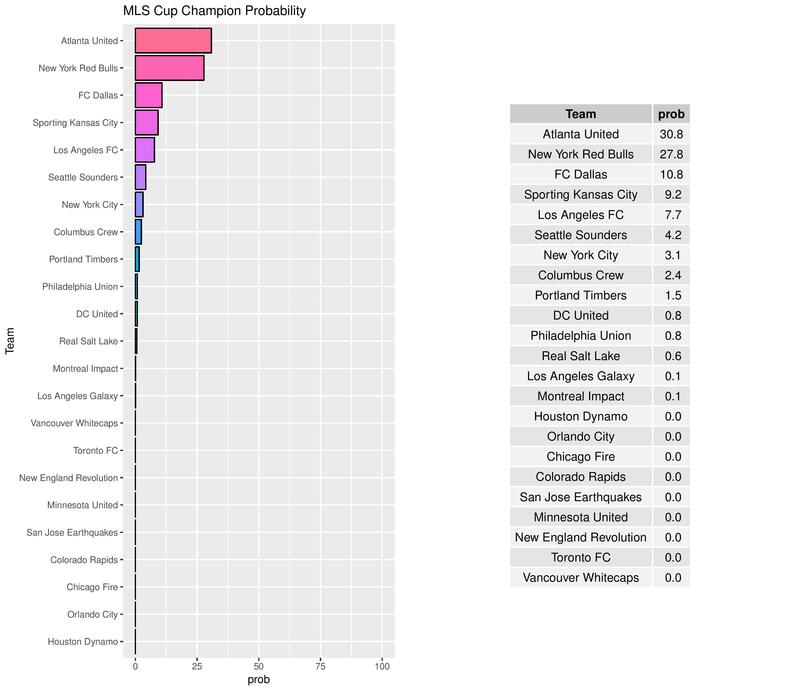 The Union remained at a 0.8% chance of winning the MLS Cup. 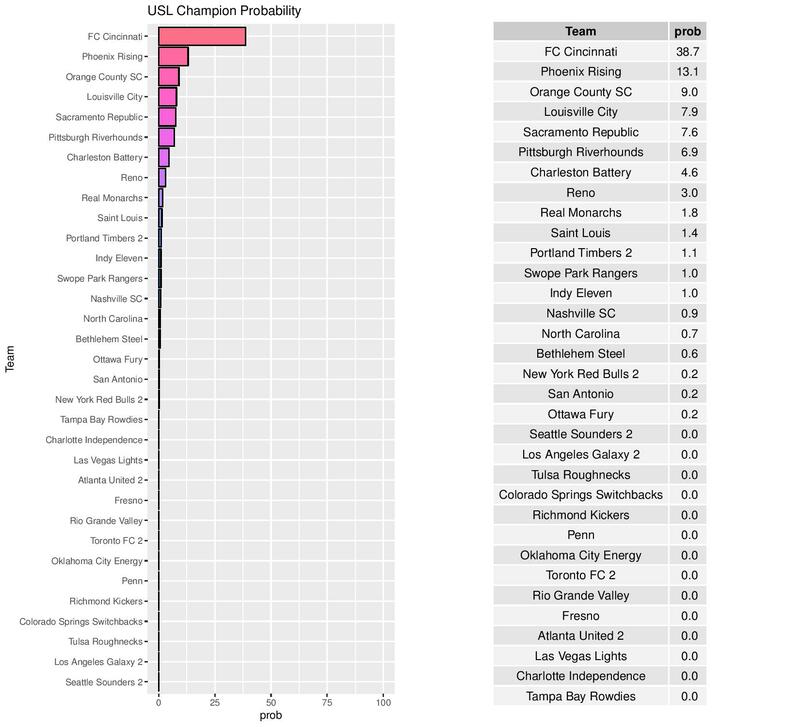 Philadelphia decreased from a 35.7% chance to a 0.8% chance of qualifying for the 2019 edition of the CONCACAF Champions League. 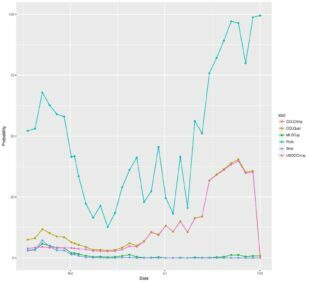 The following are Philadelphia’s odds at different prizes over time. 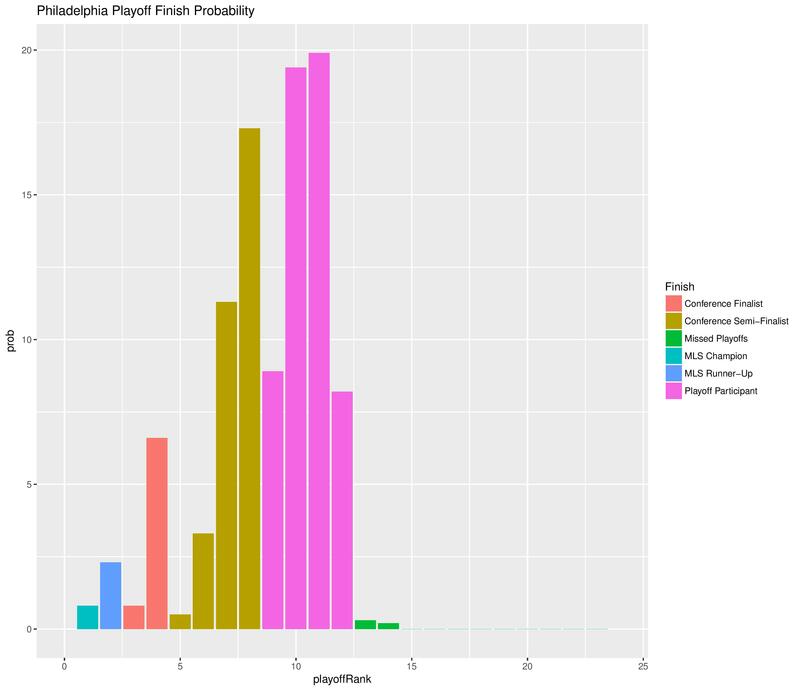 The following are the probabilities of each final playoffs placement for Philadelphia. The following shows the summary of the simulations in an easy table format. Next is a table showing the difference between this forecast and the last forecast. 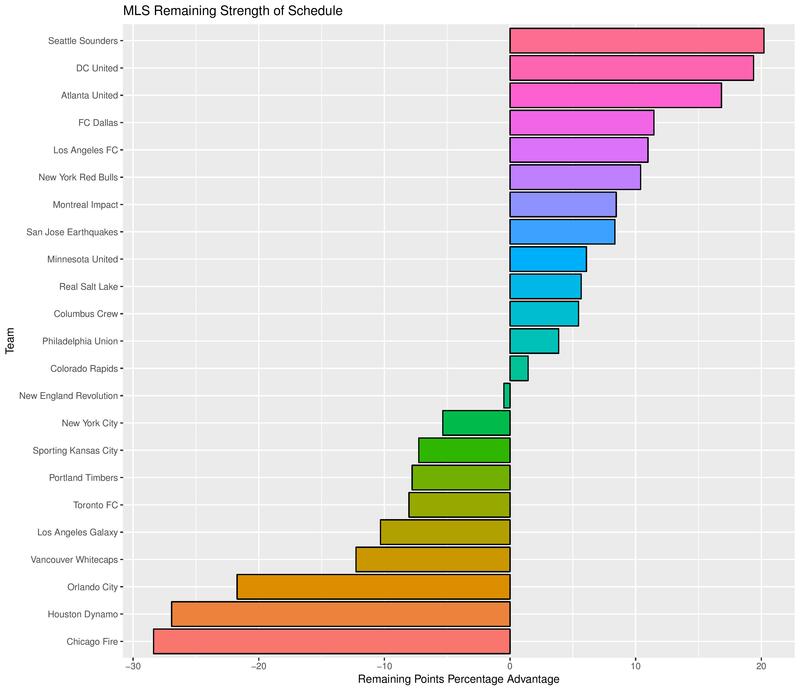 The following shows the difficulty for each team’s remaining schedule. Higher values means an easier remaining schedule. 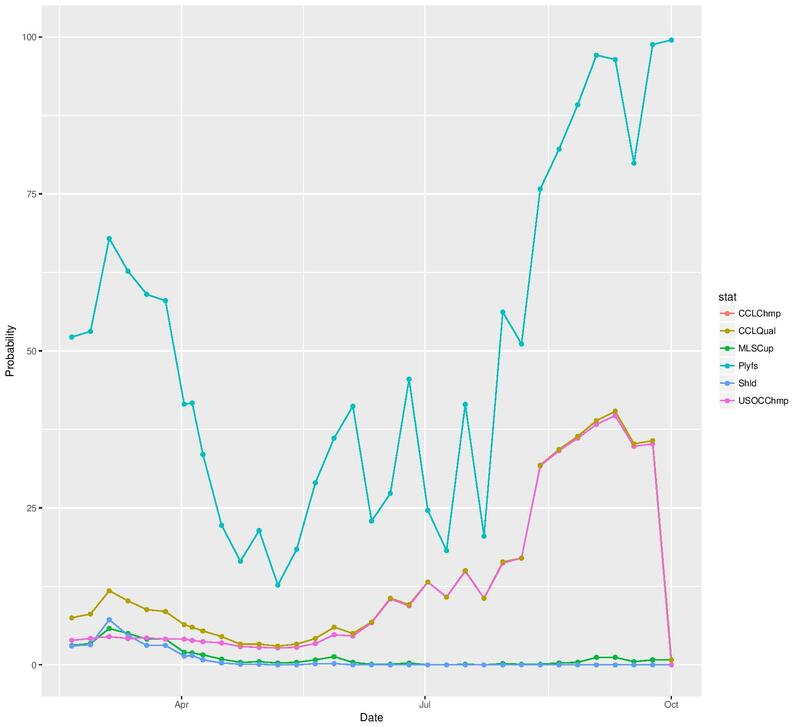 The following shows SEBA’s model error compared with random guessing. 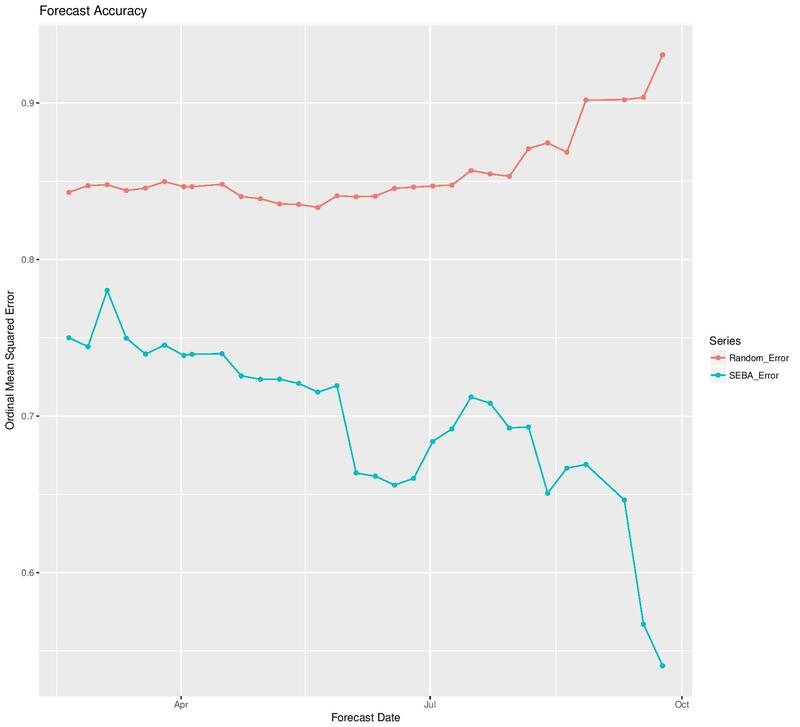 To do this, we save forecasts for the entire season’s games for every forecast’s data, and update the error charts all the way through the season. SEBA has Bethlehem declined from 13th to 14th. 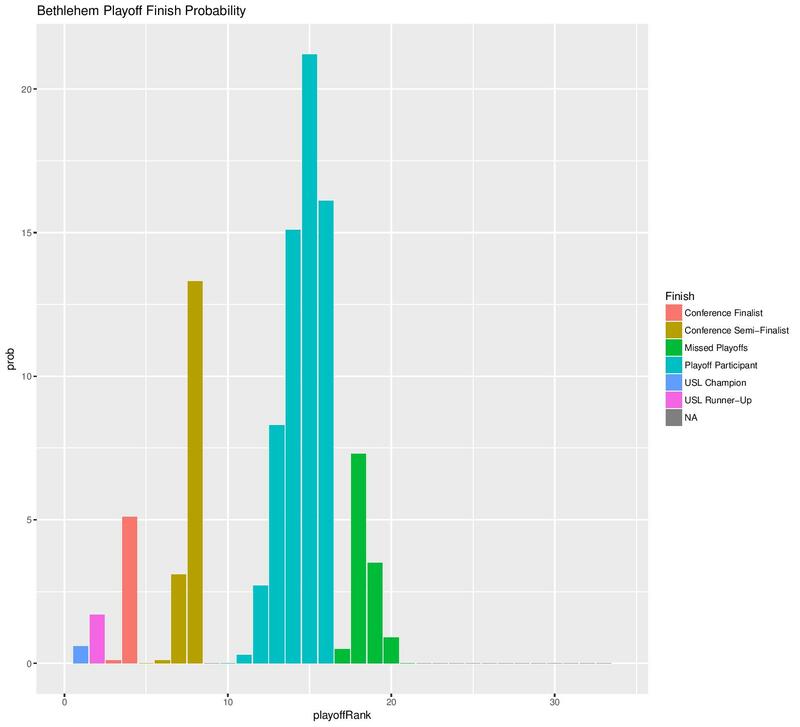 Bethlehem increased from an 84.7% to an 87.8% chance of making the playoffs. 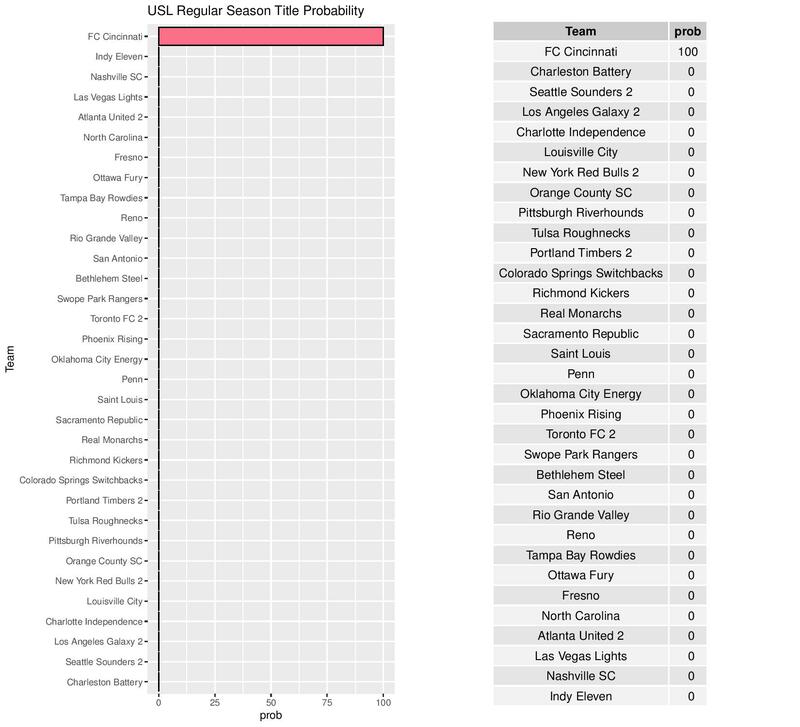 Bethlehem’s odds of winning the USL championship decreased from 0.9% to 0.6%. 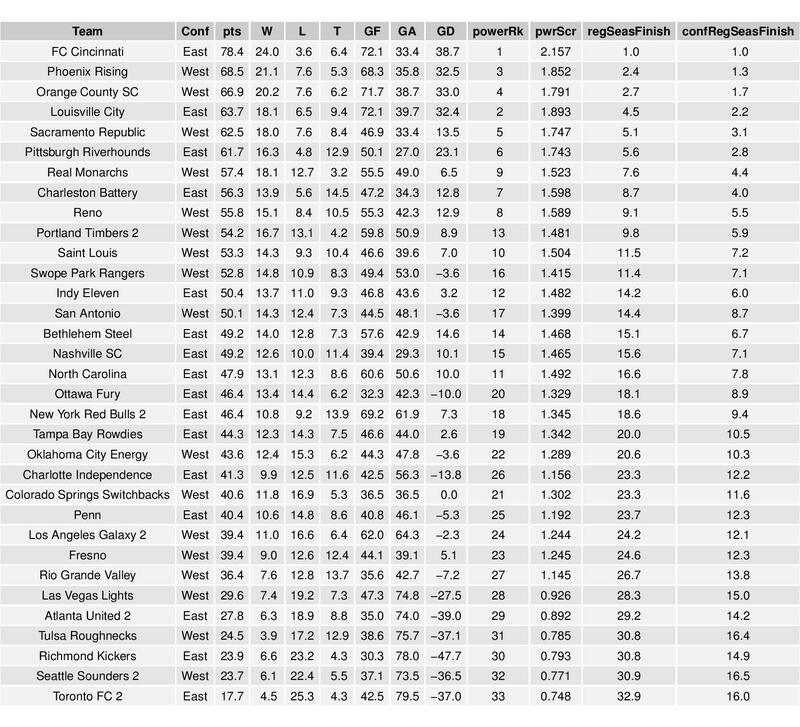 The following are the simulation averages in an easy, combined format. 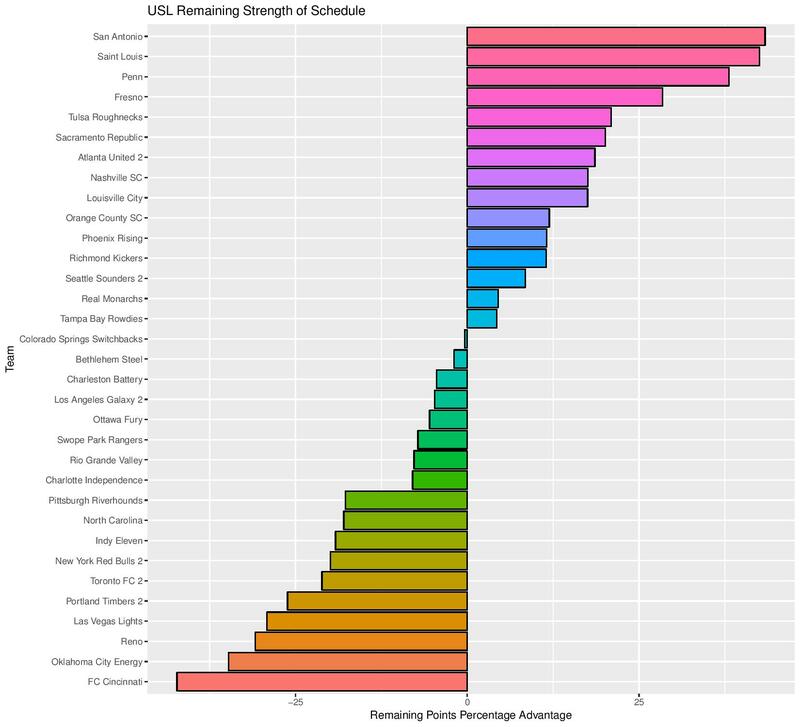 The following is the strength of remaining schedules for each team. 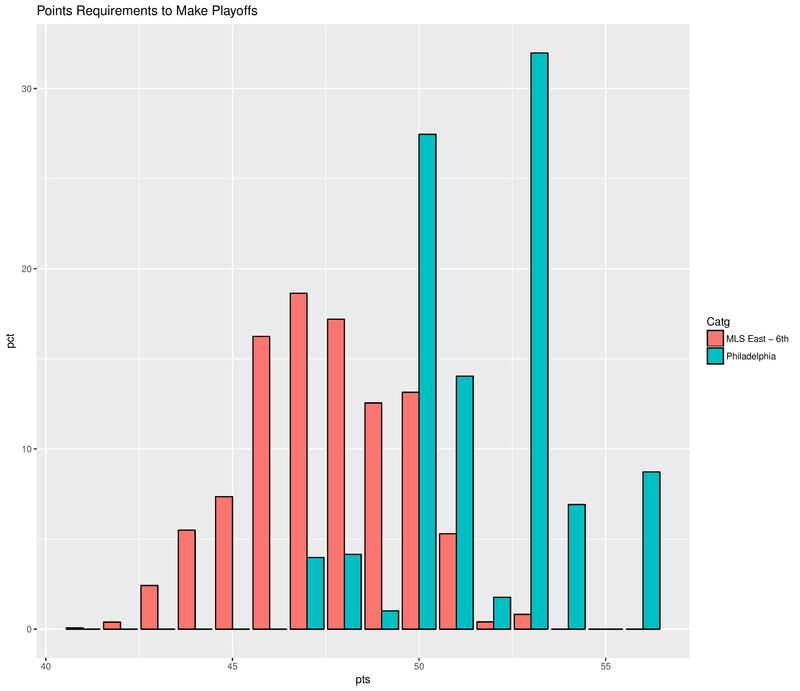 Higher values mean an easier remaining schedule. The following are the upcoming expectations for Bethlehem matches.